August 19, 2013 by C.S. Clarke, Ph.D. I meant to post this before my last post. As you could see from that post, I’m leaving the subject of résumés and going to the subject of writing. Usually I like to do something for a transition. But, I hadn’t finished the artwork yet. Considering how much chatter there is among webmasters, bloggers and internet marketers about Google’s Panda and Penguin algorithms, I thought I’d add a bit of levity to the conversation. 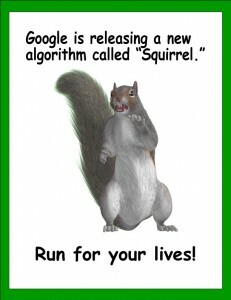 I ran across a photo of a startled squirrel and thought “That’s just what I look like whenever I hear another update of Google’s algorithms is coming.” So, I made a printable poster with an image of my own. You can download and print it for personal use if you like (or you can “pin” it if you wish. Remember to give credit.) Hope it makes you smile. Just click on the image to get the 8 1/2 x 11 printable pdf.